On July 30, 2008, the Honorable Jawad Karim al Bulani, Iraqi Minister of the Interior, visited the National Law Enforcement Officers Memorial to lay a ceremonial wreath in honor of all law enforcement officers killed in the line of duty. Minister Bulani’s trip to the Memorial was a joint effort by the U.S. State Department and the U.S. Department of Defense. NLEOMF Chairman Craig W. Floyd welcomed Minister Bulani, saying, “This wreath-laying ceremony is a symbol of the service and sacrifice of law enforcement officers around the world.” Floyd also noted that, since 2003, approximately 12,000 Iraqi police and security officers have paid the ultimate sacrifice. “We are proud partners in Iraq’s quest for freedom and democracy,” said Floyd. Over the past century, Harley-Davidson has been supplying motorcycles to law enforcement agencies across the United States. Now, friends and supporters of law enforcement have an opportunity to win a new Harley for themselves – and, in the process, support the effort to build the first-ever national museum dedicated to the law enforcement profession. The National Law Enforcement Officers Memorial Fund is raffling a 2008 FLHR Road King, which has been donated to the Memorial Fund by Harley-Davidson. All proceeds from the raffle go toward the National Law Enforcement Museum, a world-class facility scheduled to open in downtown Washington, DC, in 2011. The motorcycle is on display at the Memorial Visitors Center & Store, 400 7th Street, NW, Washington, DC. Tickets are $25 each, and only 2,500 tickets are being sold. They are available through the Visitors Center. The drawing will be held on September 5, 2008, and the winner need not be present to win. Authorized by Congress in the year 2000, the National Law Enforcement Museum will be an architecturally inspiring, 95,000 square foot, mostly underground museum located just blocks from the U.S. Capitol and adjacent to the National Law Enforcement Officers Memorial. The Museum will provide an estimated 600,000 visitors a year with a unique and comprehensive look at the law enforcement profession. The Museum will feature high-tech interactive exhibitions, interesting historical and contemporary artifacts, extensive public and educational programming, and a research center. The privately funded Museum has launched an $80 million capital campaign, with nearly $36 million raised to date. Former Presidents George H.W. Bush and Bill Clinton serve as co-chairs of the Museum’s National Honorary Campaign Committee. In 1908, Harley-Davidson Motor Company delivered its first motorcycle for law enforcement use to the Detroit Police Department. Since then, the company has been working closely with law enforcement groups around the country. Last year, Harley-Davidson announced it was donating three brand new motorcycles to the Memorial Fund in support of the Museum’s “Matter of Honor” campaign. During National Police Week 2008, the Memorial Fund raffled the first of the motorcycles, a one-of-a-kind Harley Softail Classic, raising approximately $20,000. For more information about the raffle, call the NLEOMF Visitors Center at (202) 737-3213. To learn more about the National Law Enforcement Museum and take a virtual tour, visit http://www.lawenforcementmuseum.org/. 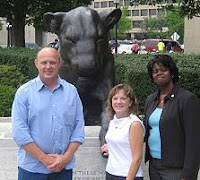 For the second year in a row, the recipients of the Vantagepoint Memorial Scholarship Fund visited the National Law Enforcement Officers Memorial on July 14, 2008. The Vantagepoint Public Employee Memorial Scholarship Fund is a program, founded in 2001 by the ICMA Retirement Corporation (ICMA-RC), to honor our nation’s police officers, firefighters, and other local and state government employees who have lost their lives in the line of duty. The Scholarship Fund awards scholarships to the surviving children and spouses in amounts up to $10,000 annually for post-secondary education. Historic Union Station serves as the location for the awards ceremony and, for many of the recipients, this is their first trip to Washington, D.C. The recipients and their families were invited to participate in a “Heart of America” tour that included a trip to D.C.’s Fire Engine Company 3 and the National Law Enforcement Officers Memorial. This year, 21 of the 40 recipients are the children of law enforcement officers who died in the line of duty. Brian Lacey, Memorial Programs Operations Manager, showed the group around the Memorial park and provided a brief history of the Memorial. 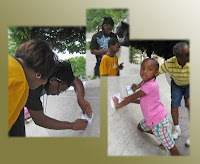 After the short tour, the group found the names of family members and friends on the Memorial and did their own etchings, taking a moment to reflect on their loved ones. It meant a lot to them to visit the Memorial during their trip to Washington and to have an opportunity to view their parent’s name engraved on the wall. The NLEOMF offers our congratulations and best wishes to the 2008 recipients as they continue their education, and we look forward to greeting next year’s recipients of the Vantagepoint Scholarships at the Memorial. On July 9, 2008 the National Law Enforcement Officers Memorial Fund had a special visit from Officer Stephen Cooke, a 25-year veteran of the Australian National Police Force, currently assigned to the Sidney Police Department. 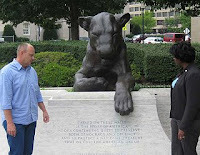 What led Officer Cooke to the NLEOMF? Sergeant Cooke had applied for an Australian Grant from the Winston Churchill Memorial Trust. Through their grants, the Trust assists Australians who are interested in researching support for victims, evaluating how other countries help their survivors, and determining how these programs could help Australian citizens affected by crime. After three years of applying for the grant, Sergeant Cooke was successful. He was awarded the grant and he traveled abroad with an important mission – find ways to help the survivors of police officers who were killed in the line of duty. The NYPD Human Resources department called the NLEOMF after they had met with Sergeant Cooke regarding New York state programs for survivors of police officers killed in the line of duty. They thought that the NLEOMF could help the Sergeant further his research and provide him with other contacts. While in Washington, Sergeant Cooke met with Berneta Spence, NLEOMF Director of Research; Martha Wood, a survivor; and, Suzie Sawyer, Executive Director of Concerns of Police Survivors (C.O.P.S. 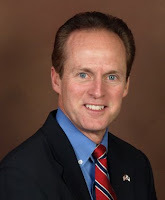 ), to discuss Memorial and survivor organizations. During a two-hour conference call, Ms. Sawyer spoke about the creation of C.O.P.S. as well as the different programs for survivors of fallen law enforcement officers. Mrs. Wood was there as well, sharing her story about the loss of her husband, Barry. NLEOMF Chairman Craig Floyd met with Mrs. Wood and Sergeant Cooke before the Sergeant returned to Sidney by way of Vancouver, Canada, and England. Before he left, Sergeant Cooke presented Ms. Spence with a plaque, decorated with the Australian National Police Force badge, to express his appreciation to her and to the NLEOMF for their help in furthering his research and helping the survivors of police officers killed in the line of duty. I am very pleased to report law enforcement fatalities dropped to their lowest level in more than 40 years during the first half of 2008. Read the NLEOMF press release and accompanying report for details. Here is a link to the USA Today article on this issue that appeared on July 10th. Please feel free to share this information with anyone else you think might be interested. Our preliminary data shows that 59 federal, state and local officers were killed in the line of duty between January 1 and June 30 of this year, compared to 100 law enforcement fatalities during the same period last year—a 41 percent decrease! We must always honor and never forget the 59 officers who died or the 59 families of those officers who have been devastated by their loss, but this is indeed encouraging news. As you know, 2007 was one of the deadliest years for law enforcement in the last two decades, with 181 fatalities nationwide. That unexpected upsurge in law enforcement fatalities received a lot of public attention. While the dangers facing our officers have not decreased, it appears that law enforcement leaders, trainers, policymakers and, most importantly, officers on the street are doing a better job preparing for those dangers. The result has been increased training, better equipment and a law enforcement professional that approaches every assignment as if it could be life-threatening. Thanks so much for helping us promote law enforcement safety through your generous support! One of our main missions is to provide information that will help promote law enforcement safety. With your assistance, this mission is being accomplished. And, through the Research Center that will be such an important part of the National Law Enforcement Museum, we will be able to do even more to help promote law enforcement safety! This article was originally published in PoliceOne.com. When most people think of law enforcement in America, one thing comes to mind: crime fighting. Whether their impressions are based on personal experience or, more likely, the news and entertainment media, Americans tend to view law enforcement as the people who patrol our streets, respond to 911 calls, investigate crime and apprehend the bad guys. All of which is true, and all of which captures one important aspect of law enforcement work. But from the earliest days of our nation, our law enforcement professionals have played another vitally important role – a role that is not always evident to the general public, but one that is fundamental to the strength and greatness of our country. That role: defender of freedom and protector of individual liberties. Think about it. Whenever people gather to exercise their right to free speech, who do they call upon for protection and safety? They call on law enforcement. Whether it is single person on a soapbox in a municipal park or a million people marching in our nation’s capital, law enforcement is there to safeguard the First Amendment rights of our citizens. Many times, of course, ideas or opinions are in conflict, and people on opposing sides of an issue clash during protests and counter-protests. Again, it is law enforcement that has the unique responsibility not only to protect the free speech rights of each side, but also to maintain the safety of everyone involved. And when people gather to petition their government and call for change – something that many countries of the world simply do not tolerate – in the United States, it is law enforcement that defends these precious rights as well. As human beings, our peace officers may personally detest the opinions or policies being advocated by a particular group. I will never forget, for example, the police officer who was safeguarding the right of three individuals protesting against police brutality several years ago at the sacred grounds of the National Law Enforcement Officers Memorial. But as law enforcement professionals, these public servants have sworn to uphold and defend the Constitutional rights of all Americans. Day in and day out, they do so with tremendous skill, objectivity and courage of conviction. Tragically, far too many law enforcement professionals have lost their lives protecting our communities and safeguarding our freedoms. The walls of the National Law Enforcement Officers Memorial contain the names of 18,274 heroes who have died in the line of duty throughout our nation’s history. Their collective sacrifice reminds us of the nobility of their mission and the dangers inherent in their work. So, this Independence Day, as we take time to celebrate our freedom and remember those who make it possible, let us not forget the brave men and women of law enforcement – those who have made the ultimate sacrifice for our safety and freedom, as well as those who continue to serve and protect our communities and staunchly defend the rights we, as Americans, will always cherish. Prince George's County Maryland Police Corporal Richard S. Findley was well known in professional circles for his unwavering dedication to his work, his friendly and warm personality, and his willingness to be a team player. He was full of life, but his life quickly came to an abrupt end on June 27, 2008 when he was killed in the line of duty after being run over by a 19-year-old thief driving a truck. A member of a specialized squad in the police department that pursued dangerous criminals and car thieves, Findley was killed within a two-mile radius of where his good friend, colleague, and member of the same unit, Corporal Steven Gaughan, who trained Findley, was killed in 2005. On the back of Findley's police cruiser, Gaughan's badge number was visible. His public service did not begin and end with the police department. For twenty years, Findley served as a volunteer for the Prince George's County Maryland Fire Department. He began his fire service at the Calverton station in 1988. "He was dedicated to the volunteer fire department. He was always active and always wanted to be a part of something. He always had a good attitude. He was very cooperative and helped me do my job better," says Captain Charles E. Flinn who was the station commander at Calverton when he met Findley. Sharing the sentiment of many firefighters and police officers who are presently grieving the tragic loss of their colleague, Flinn continues, "I was very upset to hear about this. He was an exemplary public servant. It is hard for me to take right now. I feel terrible about it." Though police officers and firefighters recognize and understand the inherent risks that come with the territory of their jobs, the impact of the victimization that results from dangerous situations, with lethal consequences, is not an easy pill to swallow. The common denominator among police officers, firefighters and medics is the unity they share within the brotherhood of each separate group as well as the interconnectedness of both groups. However, the "family" extends beyond and to all components of the criminal justice system including prosecutors' offices, courts, sheriffs' departments, and others who interact in the realm of public safety. Everyone is profoundly touched by the death of a colleague even if they were not personally acquainted. It's all the harder if they worked directly with the victim or shared a close friendship. However, the ability to be able to reminisce and share stories about the relationships that existed throughout the tenure of service or period of friendship helps the survivors to slowly cope with the initial shock of the event, the difficult aftermath, and the enduring loss. Coming to grips with the reality of what transpired is by no means easy. "It's a scary sign of the times. Some of these guys on the street have no qualms about killing officers," says Glenn F. Ivey, State's Attorney for Prince Georges County Maryland. Any efforts to make sense out of the senseless, vicious criminal acts that lead to loss of a valuable life, such as Findley's, are an insurmountable task. "It shows you that each day a public safety officer, either firefighter or police officer, goes on duty that your life may end protecting citizens of our communities. This is another tragic loss that each day we all pray that a day could go by without an injury or loss of life. We not only lost a public safety servant but a brother in the pursuit of protecting others," says Jack Goldhorn, a Public Information Officer and 24-year veteran of the Norfolk Virginia Fire and Rescue Service. Beltsville (Prince George's County) Maryland Volunteer Fire Chief, Al Schwartz, who has been a chief for 25 years, knew Findley for 15 years through his association with the fire department. Findley was a volunteer firefighter for the past 20 years. "Twenty years later he still wanted to do it," says Schwartz. Noting a somber mood at the fire station, he explains that the station where Findley served was placed out of service so the firefighters and medics would not have to run calls and would have time to deal with their loss and grief. Crews were constantly filling in and covering for their colleagues throughout the county. "It shows how tight the family is," says Schwartz. "He loved the fire department, the police department, and he loved his family. He wanted to clean the streets up. He wanted to get the drugs and weapons off the street. Its a shame. He's definitely going to be missed more than anyone can imagine," says Schwartz. The police department was also grieving the loss of their colleague but, all the while, officers throughout the department and the region were on high alert and determinedly searching to apprehend the criminals involved in this heinous act. "Corporal Findley was doing the type of 'routine' police work that officers do every day, and it turned tragic. The response of the law enforcement and public safety community was fast and deep. The ability of the responding officers to remain focused and pursue the leads in a professional manner enabled investigators to narrow down the vast amount of information and make an arrest within hours of the tragic event. 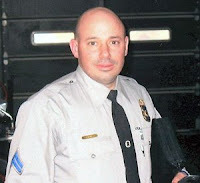 The professionalism and dedication is evident when looking at the continued work of officers who report to work for their next shift with the knowledge that their brother officer was stricken down only hours before," says Major Daniel Dusseau of the Criminal Investigations Division of the Prince George's County Police Department. For survivors to deal with the loss of a colleague, it is important for them to communicate with one another by sharing stories and recollecting fond memories. Chief Schwartz recalls that Findley could always make someone smile, and he was skilled at making noises that resembled, with high accuracy, the sounds of sirens, animals, and other things that would make people laugh. "He was the type of person who was always upbeat, cheerful, and goofy - all in one. His personality was one of a kind," says Schwartz. "He had a whimsical sense of humor," says Firefighter Mike Shipp, agreeing with Schwartz. Though police officers and firefighters who are killed in the line of duty receive tremendous support from their respective departments and organization such as Concerns of Police Survivors (COPS) and the National Fallen Firefighters Foundation (NFFF), coping with the loss is still very difficult. Findley's wife, Kelly, also served as a volunteer at the fire station, and she is now left behind with two young daughters - Lauren, age 6 and Nicole, age 9. "I don't know if we ever will recover. He was a police officer and would stop by the station but he was one of our own," says Firefighter Shipp. "Each police officer understands and accepts there are risks involved in their chosen profession, but this does not make it any less tragic when an officer is injured or even killed while protecting others," says Prince William County Virginia Police Chief Charlie Deane. Everyone in the fire service, as well as the criminal justice system, is impacted by the devastating victimization of a colleague. In this particular case, the tentacles of grief spread far and wide between the fire and police departments where Findley served with unquestionable dedication and enthusiasm. United States Senate Sergeant-at-Arms and former U. S. Capitol Police Chief, Terrance W. Gainer, widely experienced in dealing with line of duty deaths and criminal victimization in his tenure of four decades in law enforcement, keenly points to the crux of the issue, "I did not know the Corporal personally, but I have met and worked with hundreds just like him. Honest, dedicated, and committed to public service and family. He was working that stolen auto case as if it happened to someone in his family and as if it was the biggest crime of the century. There was a wrong, and he tried to bring some right. Each death of a cop, or a fireman, and every innocent victim, diminishes us all." Karen L. Bune is employed as a Victim Specialist in the domestic violence unit of the State's Attorney's Office for Prince George's County, MD. She serves as an Adjunct Professor in the Department of Criminal Justice at George Mason University and Marymount University in Virginia, where she teaches victimology. Ms. Bune is a consultant for the Training and Technical Assistance Center for the Office for Victims of Crime, U. S. Department of Justice. She is a nationally recognized speaker on victim issues. Ms. Bune is Board Certified in Traumatic Stress and Domestic Violence and she is a Fellow of the Academy of Experts in Traumatic Stress. She appears in the 2008 edition of Marquis "Who's Who in the World."